Since the original Air Force SBIR grant in 2007, Alelo has developed VCATs for over 85 countries that have been used by 90,000 members of the U.S. and allied armed forces. The projects have generated over $23M in revenue for Alelo. 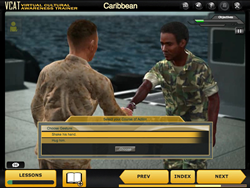 In 2007 the Air Force awarded Alelo an initial Phase I SBIR contract to develop a “multimedia approach to realistic social and cultural skills training”. The goal was to provide U.S. service members with true intercultural competence for conducting successful operations and obtaining the highest level of cooperation with partner foreign forces. The Air Force awarded Phase II and Phase III contracts in 2008 and 2010, respectively. The project’s outcome was technology and methods for creating and delivering VCATs, which teach critically important cultural awareness and language skills that personnel deploying to different regions of the world need to conduct their missions successfully and safely. A key learning objective is how to quickly develop deep trust and cooperation from local armed forces and civilian populations. The latest round of VCAT contracts was awarded in early 2016 for the development of courses to cover joint training with the military of host nations, providing humanitarian assistance, and participating in leadership engagements in Egypt, Iraq, Jordan, Lebanon, Afghanistan and Pakistan. Languages covered are Modern Standard Arabic, Urdu, Pashtu and Dari.